Dune Walker. One of the main dunes in Namibia's Sossusvlei area heading towards the famous Deadvlei. 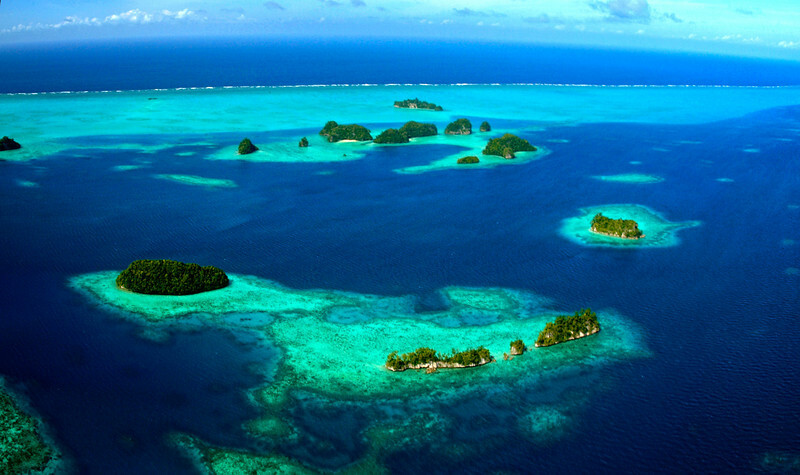 The Famous 70 Islands of Palau. Although you can dive near them, they are protected and you cannot go aground. Dos Mosquises island which is part of the Los Roques archipelago in Venezuela. This island is not really inhabited apart from the Turtle Sanctuary which you can see here. Namib Nakluft Valley Dunes. Taken from a Balloon trip The main road you can see leads from the entrance of the park to the main centre of the area. This area is reached by normal cars, but further on the left, you need a 4x4. This leads to the famous Deadvlei area. Lebala Lagoon Sunset in the Kwando Concession of Botswana's Okavango Delta. A typical sunset in the region. Ghost Trees in the Sossusvlei Area of Namibia. This is the furthest you can get to with 4x4s. This is the Perito Moreno Glacier in Patagonia, Argentinaa. 5,000 meters wide and 20 meters high. 250 square kilometers of glacier actively moving down the valley. You can also take trips to walk across it. Sunset at The Design Suites hotel in Calafate (Patagonia), Argentina. A great place to stay when visiting the area. Linyanti Sunset in the Kwando Concession of Botswana's Okavango Delta. Sunset view of Marina Bay in Singapore. The building to the left is Marina Bay Sands hotel. Blue Corner Palau - One of the top dive sites of the world. Sunrise from a balloon of the Namib Nakluft Valley. This is one of the most amazing sights you can get in this part of Namibia. The red dunes in the background are the Sossusvlei national park. 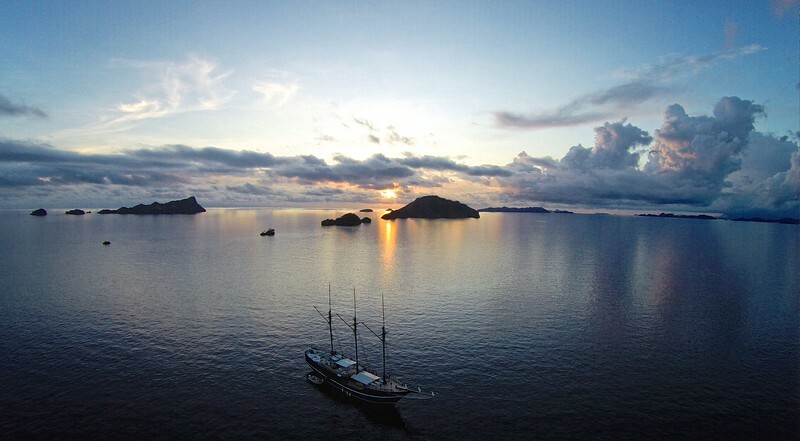 70 Islands Palau from a helicopter. Desert road in the NamibRand reserve in southern Namibia. Botafogo Bay - View of the Flamengo district of Rio de Janeiro in Brazil. This is taken from the first level of the Sugar Loaf mountain. You can also go higher to the top of the second level by cable car seen at the right of this photo. Sunset at Hermosa Beach in California, USA. A view from the dining room at the Tufi Dive Resort. Tufi is and area in Papua New Guinea, south west of the capital Port Moresby. This area of PNG is characterised by fjords very much like those found in Scandinavian countries. The dive sites around here are amazing. One of the best ones, ironically is the house reef found at the boat jetty itself. A incredible place for muck diving. The Upsala Glacier is a large valley glacier in Argentina's Los Glaciares National Park. It flows out from the Southern Patagonian Ice Field, which also feeds the nearby Perito Moreno Glacier. The terminus of the glacier is at Lago Argentino. The wonderful colours of the NamibRand Valley in southern Namibia. Evening view of Media City in Dubai, UAE. The San Francisco–Oakland Bay Bridge (known locally as the Bay Bridge). Its part of Interstate 80 offering a direct route between San Francisco and Oakland; carries approximately 270,000 vehicles per day on its two decks, and has one of the longest spans in the world. The toll bridge was conceived as early as the gold rush days, but construction did not begin until 1933. It opened for traffic on November 12, 1936, six months before the Golden Gate Bridge. View of the main bay in Buzios, Brazil. This town is about 2-3hours drive north from Rio de Janeiro. A great area to visit with lots of beaches around the Peninsula. Its also a great party place during the summer months. This photo is taken from the pool of the Casas Brancas boutique hotel in Buzios. View of the valley & Dillon Lake leading to Breckenridge ski resort in Colorado, USA. Great ski resort and within an hour's drive of quite a few other resorts like Vail, Arapahoe which can be visited in a day. One of the valleys within the Petra temple complex region of southern Jordan. VIew of the Wadi Rum national park in southern Jordan. 3 hours drive from Petra. View of Central Park taken from the top of the rock. Personally, I prefer to go here to get a view of the skyline as opposed to going to the top of the Empire Sate building as you get to actually see the Empire State building itself when taking photos. Obviously this is the view looking north, but still a great view. View from the top of the Niseko ski resort in Hokkaido, Japan. The mountain in the distance is Mount Yotei. View of the Manhattan Skyline taken from the top of the Rockefeller centre. As mentioned in some of the other photos taken on this site, I prefer to come here as you get to see the Empire State building in the photos. The Temple of Golden Pavilion in Kyoto, Japan. (Kinkaku-Ji in Japanese). Kinkaku-ji's history dates to 1397. The Golden Pavilion is a three-story building on the grounds of the Rokuon-ji temple complex.The top two stories of the pavilion are covered with pure gold leaf. The pavilion functions as a shariden, housing relics of the Buddha (Buddha's Ashes). View of Osaka city in Honcho Japan. The Perito Moreno glacier in Patagonia, Argentina seen from the road leading up to the entrance. I took this whilst visiting the highest point in the Petra Temple complex. As you can see is so high you can hardly see people down below. The Craziest thing was the local man who felt the best place to sleep would be about 30 centimetres from the edge of the highest ledge. For his sake I hope he doesn't move much when he sleeps. He's a braver man than me! This is a Japanese Zero plane. 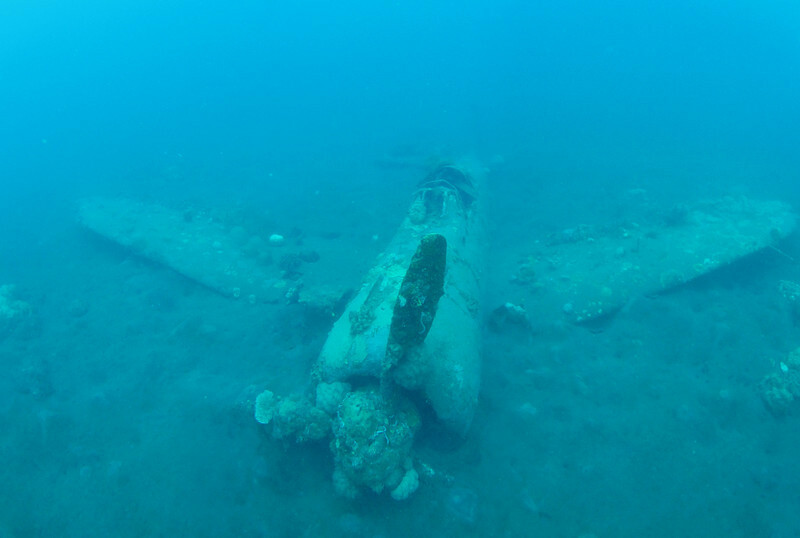 It crashed during WW2 here in the island of New Britain in Papua New Guinea. The muddy and silty ground makes it often difficult to spot, but it an enjoyable dive to make. View of one of the valleys in the Petra Temple Complex in southern Jordan. View of Rio de Janeiro from the Tijuca national park in Brazil. This view allows you to see most of the city. Barely visible on the left hand mountain peak is Christ the redeemer. Sunset taken from the top of the airport hotel in Port Moresby, Papua New Guinea. Hatshepsut Temple near Karnak, Egypt. (Hatshepsut; meaning Foremost of Noble Ladies; 1508–1458 BC) was the fifth pharaoh of the Eighteenth dynasty of Ancient Egypt. She is generally regarded by Egyptologists as one of the most successful pharaohs, reigning longer than any other woman of an indigenous Egyptian dynasty. View of the Bay Bridge and San Francisco, USA. The Wadi Rum Valley in southern Jordan.